INB was founded in 1989 by a group of local business people who were unhappy with the fact that Spokane headquartered banks were getting absorbed by large, out-of-state banks. They strongly felt that being headquartered locally allows a bank to be more responsive to the needs of the local community. Today INB has total assets of nearly $630 million, having grown from less than $4 million the year of their inception. Beyond the convenience of virtual banking, utilizing a network of strategically placed locations, and offering competitive banking products, INB is home to experienced banking professionals that can help manage the many different aspects of your financial future including personal and business banking, commercial and consumer lending, and mortgage and construction lending. After a thorough assessment and consultative approach, Cerium provided a complete Cisco network refresh and Microsoft Cloud PBX (Office 365) deployment. The network included Cisco routers, switches, and firewalls. Cerium provided design, configuration, and cutover services for the new Cisco Catalyst LAN switch and Cisco Integrated Services Router (ISR) devices. Microsoft Cloud PBX, AudioCodes Cloud Connector Edition, Microsoft Azure, and Polycom IP Phones. Centralized management over INB’s branch locations. INB has 16 locations throughout the Spokane area, North Idaho, The Palouse, and the Tri-cities. INB’s parent company, Northwest Bancorporation, Inc., was established in 1991 and trades with the symbol NBCT as a publicly held company. INB’s mortgage department, obtained through the purchase, and subsequent merger of a mortgage company in 1998, is now one of the larger mortgage loan originators in the Inland Northwest market, with as much as $100 million in home loans per year. In addition, the mortgage department works with home builders to nance the construction of new housing in and near INB’s primary market area. INB had a traditional PBX, which had not only reached end-of-life, but was also at capacity. New employees were forced to use cell phones for communications, which meant 4-digit dialing was not available for them. This inconvenience and disparity from the company messaging system affected their ability to attract and retain talented staff. The technology was just not present to support either employee productivity or customer service to the level that INB had envisioned. 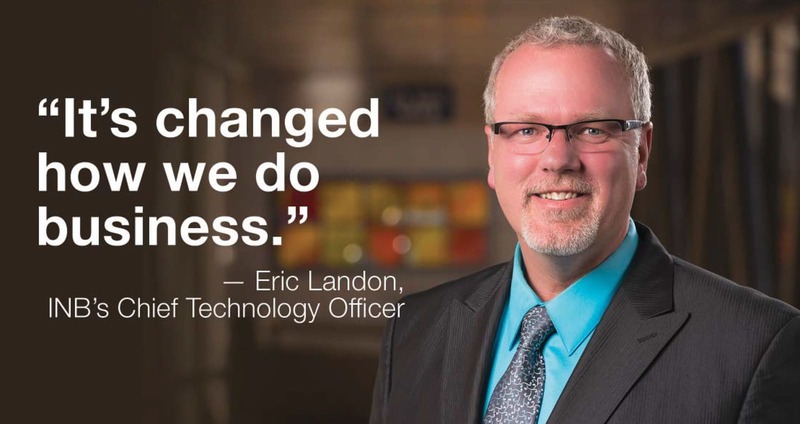 Eric Landon, INB’s Chief Technology Officer, was hired to correct this problem. Eric brought 20 years of experience to INB with him, which included experience with Microsoft Lync on a voice platform. The initial inspection of the INB infrastructure and voice system revealed antiquated communication lines, and therefore, a need for a complete refresh and expansion of the network architecture, with a security emphasis. Eric realized he had to really tackle functionality for communications with the same level of immediate urgency as he would address the infrastructure. The new infrastructure needed to support VoIP initiatives. Could applications such as email and telephony live in the cloud successfully and securely? Did ATM and electronic banking services need to remain private? Which business application and computing workloads could migrate successfully to Microsoft Azure and which needed to remain within the organization’s management domain (primary and secondary data centers)? It was this thorough assessment, and consultative approach, that helped INB arrive at their final solution decision. 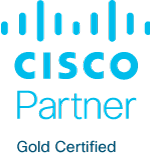 Cerium provided a complete Cisco network refresh and Microsoft Cloud PBX (Office 365) deployment. The network included Cisco routers, switches, and firewalls. Cerium provided design, configuration, and cutover services for the new Cisco Catalyst LAN switch and Cisco Integrated Services Router (ISR) devices. The PBX system was replaced by Microsoft Cloud PBX, AudioCodes Cloud Connector Edition, Microsoft Azure, and Polycom IP Phones. The solution offers centralized management over INB’s branch locations. Throughout the design process, Eric noted that Cerium, “took this engagement very seriously,” providing different levels of deployment options to meet the budgetary needs of INB, rather than saying, “here is your solution and here is your cost.” Cerium also supported INB’s decision process by exploring the risks, requirements, and viability of the solution to meet INB’s goals. “We were so far in arrears in technology enhancements. It was a great opportunity to take a giant leap instead of a small step. We considered several solutions, including on-premises solutions. Our decision to go with O365/Cloud PBX in a hosted environment came down to the expected growth of our organization, and a desire to have an easy deployment and ease of expansion. Even though it is a maturing solution, we did a lot of research,” said Eric. “With Cerium’s expertise, we determined Microsoft’s Cloud PBX could do what we needed now and in the future.” Eric went on to say that the decision to implement Cisco infrastructure was based on Cisco’s proven stability and success in the financial industry, combined with his previous experience with Cisco gear. One of the differentiators for Eric’s decision to work with Cerium was founded on Cerium’s ability to provide both the O365 and the infrastructure, demonstrated proven expertise with both, availability as a local resource, and being already proven as a vendor for INB. Throughout the phased implementation, the O365 solution was run in parallel to the NEC system. As Eric described, Cerium came up with a way to “trick” the NEC system to “think” it was the lone communication system. In reality, INB was cutover to the new AudioCodes PRI and had SIP trunking available, so the new O365 could be deployed without losing the NEC system. This strategy prevented disruption to INB’s operations, and also prevented any need for an overnight cutover, and allowed for flexibility in cutover phasing. Cerium performed due diligence with the infrastructure implementation, and the service provider for the MPLS and SIP connections, so the data cuts went quickly and smoothly at all the branch locations. This allowed the voice number cut for each location to go smoothly. Eric stated, after the second data cut/number port, that he had no idea it would go so smoothly. Cerium’s approach to changing the infrastructure and voice at the same time was able to go this smoothly because Cerium provided both of the services, so the engineers worked closely together to help eliminate any surprises. Some of the procurement and implementation decisions for this engagement were focused on the highest level of user adoption, to maximize ROI. For example, since INB had already been using Microsoft Office for their email platform, the user interface was simple and familiar. INB also standardized on a Polycom 501 phone. Every end user has the same phone on their desks. From a support perspective, this improves technical support across the enterprise, since each desk has the same technology, and it also affords ease of transition for users that travel. They will always find familiar equipment and a familiar user environment at each location. What has been most remarkable is the overwhelming and revolutionary change to productivity and the office environment. “It’s changed how we do business. It makes us so available to each other, from the phone, tablet, computer, softphone with an earbud,” said Eric. He highlights the Presence feature as the most impactful to end users. It is the layers upon which presence affords itself to end users that has given it the most revolutionary impact. Presence brings the ability to communicate with all of the channels. “It’s just so much more efficient.” He adds that staff members are also now heavily using Instant Messaging as a critical tool to make their communications more efficient. The infrastructure upgrade and the O365 deployment brought more than the tangible improvements on productivity for staff. It brought a cost savings over what had been previously spent on telco, and increased bandwidth to enable O365. It also increased the security infrastructure. The most measurable effect was the reduction in operating costs by at least 10%. Prior to implementing O365, INB had a standalone conferencing solution. Now Eric categorizes their conferencing environment as revolutionary. It is always easier to undertake technology changes one system at a time. It is less of a strain on internal resources (your IT department). For example, have your architecture in place prior to the voice deployment. That said, he is very glad they undertook both at once, as INB realized some cost savings in the combined deployment over what they might have accrued with separate projects. Secondly, Eric recommends having all disparate vendors or providers collaborate in weekly meetings. This way your telco provider, data provider, and unified communications provider are clear on the work each is doing, the most efficient timing of each party’s work, and that the work of one vendor is not impeding the progress of another.